Opinion: Good Night Oppy, A Farewell To NASA's Mars Rover NASA's admission this week that the agency has lost contact with a Mars rover brings an end to a compelling story of usefulness and resilience. An artist's concept shows a NASA Mars exploration rover on the surface of Mars. The twin rovers Spirit and Opportunity were launched in 2003 and arrived at sites on Mars in January 2004. We probably should not project human traits onto machines. But if you spend a lot of time with a mechanism — talk to it, wait to hear from it and worry about it — even scientists begin to see personality in machinery. When the Opportunity Mars Exploration Rover ended its mission this week, after more than 5,000 Martian days, NASA scientists mourned. "This is a hard day," Opportunity's project manager, John Callas, told reporters. "Even though it's a machine and we're saying goodbye, it's still very hard and very poignant." Opportunity — and its cousin rover Spirit — both landed on Mars in January 2004. They were supposed to carry on for just three months, scratching and scouring for less than a mile over the Martian landscape. But Spirit roamed for almost 5 miles and lasted for six years. Oppy, as scientists began to call the Opportunity rover, rolled over Mars for 28 miles and stayed on the job for more than 14 years. It transmitted 217,594 images — including a selfie. Spirit and Opportunity helped establish that there was once liquid water on Mars. This doesn't mean there will soon be beach resorts on the red planet, but it does confirm that some of the elements of life may have once existed there, on a world that now looks pretty dry, lifeless and cold. It's a reminder not to judge too much by appearances. Planets, and people, have histories. 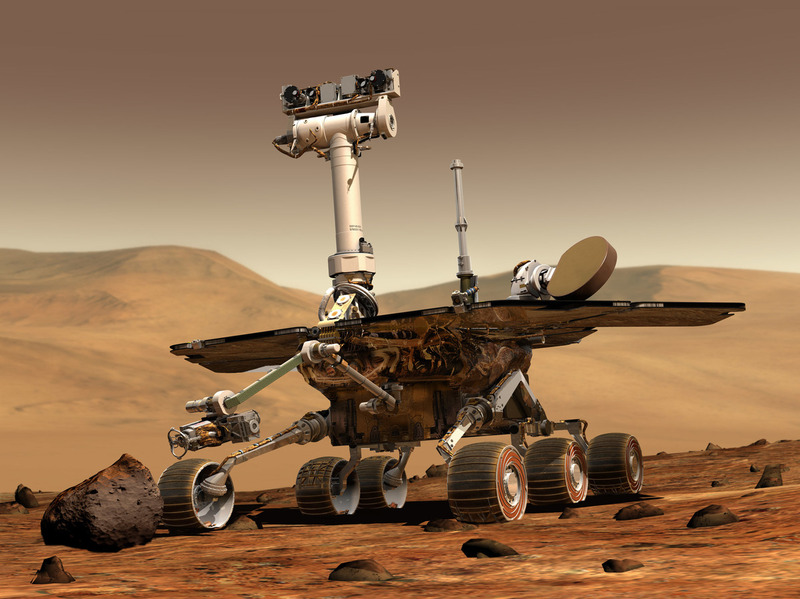 Oppy got stuck in a dune in 2005. But NASA scientists, working over a distance of millions of miles, were able to free their rover. Oppy also suffered from recurrent wheel and robotic arm problems for most of his — her — its — life, but it kept on rolling, searching, digging and sending back information. A dust storm enveloped much of Mars last June. Oppy foundered in a gully on the western rim of the Endeavour Crater; in a gully the scientists called Perseverance Valley. The storm robbed Oppy of the solar power to recharge its batteries. NASA's scientists sent up more than 830 rescue commands. They beamed music to Oppy to try to awaken their Martian explorer: David Bowie's "Life on Mars?" Gloria Gaynor's "I Will Survive," "Here Comes the Sun," by — well, you know. Oppy was too depleted to reply. The rover did send a last image, of a dark world, cloaked in dust. Jacob Margolis, a science reporter for KPCC in Pasadena, made a poetic translation of the digital bursts, bytes and squeaks Oppy sent out before going silent: "My battery is low and it's getting dark." We might all hope for such a gentle end to a useful life.